Filter out (or in) certain types of events on ports. Remap any incoming MIDI note to another, say for mapping a drum set to corresponding notes expected by an app/sound module. Transpose all notes up or down. Split the MIDI keyboard range into upper/lower splits and assign each split to a separate MIDI channel. Use this also to remap all incoming notes to a different MIDI channel. Define velocity scaling curves to remap incoming playing velocities. Remap incoming controllers and channels interdependently. Perform note microtuning based upon H-Pi (see http://www.h-pi.com) microtonal keyboards. Split the MIDI velocity range into upper/lower splits and assign each split to a separate MIDI channel. Modules are chained one to the other so can be combined. Save any module's setup into a user namable/recallable preset. So, not only can you use MidiBridge to interconnect MIDI streams from physical interfaces, wi-fi and apps with virtual MIDI, you can now apply comprehensive filtering and transformation on the event streams too! When you touch the beaker icon on any port from the main Interfaces tab, a new window will appear with the name of the port at the top (to remind you which port you are acting on) with a scrolling list of the modules available on that port. The available modules are different for source ports and destination ports. Events pass through the modules from top to bottom and events received by each module are the output events of the previous module. What this means is that events are modified cumulatively in the rack order by all active modules. A module will only act on events if it is 'On', which from the rack view means it has a green tick in the little box (like H-Pi Microtuner above). If the little box is blank, then the module is bypassed and does not act upon events. Touching a module will toggle its On/bypass state. Pressing the accessory button (arrow on the right) will allow you to configure that module in a new window. The top line of a module (in white) is simply the name of the module. The bottom line either shows a brief description of what the module does (in yellow), or, if a preset is loaded into that module (see further) then the name of that preset is shown instead; a green preset name indicates that a preset has been loaded and no unsaved change to the preset has been made. If the preset name is in red, then a preset was loaded, but the module's configuration has been changed from that preset but the new configuration has not been saved. Also, preset names are enclosed in square brackets in case you have difficulty distinguishing green from red from yellow. With the rack view, you can see at a glance all the modules, whether they are on/bypassed and any presets (saved/unsaved) loaded for a module. Event Filter - block/allow filtering of events. There is one of these at the start of each module chain and another separate one at the end. Holy Mapper - Allows the interdependent mapping of controllers and channels. When one or more modules is enabled on a port, then a badge 'On' is displayed on the port on the Interfaces page to remind you that the port has active modules. In addition, if any module blocks an event, then this badge will flash (instead of the port) to show you an event was received but was not passed on. 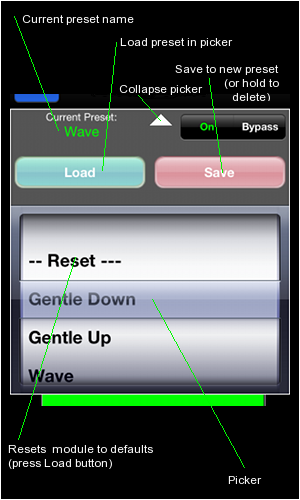 No flashing will occur if you have turned off the Visual Events option in MidiBridge Preferences. When you touch the accessory button on any module a new window is displayed that is unique to that module for configuring it. However, each configuration window shares the same feature for managing presets. A preset is simply a snapshot of a module's configuration that can be used again. 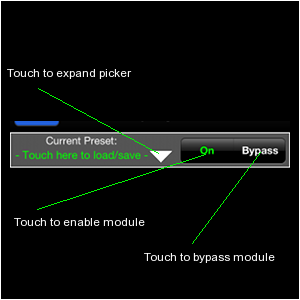 Not only does it allow you to manage your presets, but also provides buttons to bypass/engage that module (this is the same as touching the module in the rack view). If a preset is already loaded, then its name will appear under the 'Current Preset' label. If the name is in green, then the configuration of the module is unchanged since the preset was loaded. If it is in red, then the configuration has changed since the preset was loaded. Once the picker is expanded you can now load an existing preset by selecting it with the wheel and pressing the 'Load' button. This will automatically enable the module if necessary. A special preset '-- Reset --' is also available. Loading this preset will set the module to a default factory state (and bypassed). To save the current module configuration to a preset that you can reload into the module again, press ther 'Save' button and you will be prompted to name your new preset. If a preset is already loaded, then that preset's name will be pre-populated in the preset name field for you. If you save to a pre-existing preset name, then the old preset will be overwritten with the current configuration. To delete a preset, select it in the picker and then hold down the 'Save' button for about 3 seconds and then release the button. Now, let's look at each module in turn. The Event Filter module allows you to filter out (or in) certain types of MIDI events from passing through the module. Allow mode specifies that events which match the event types/channels specified below are used. All events that do not match the event types/channel matrix settings will be ignored. This type of filter is generally used to focus in on a particular type of event stream. Block mode specifies that all events received are allowed unless they match the event types/channel matrix settings. This type of filter is generally used to exclude unwanted events from the capture/midi thru. This option is no longer present in this version of MidiBridge. Instead, you use the Note Splitter module (a preset mapping channel 10 to 1 is included as a factory preset) to remap channel 10 to another channel for use in apps like Sample Tank. The channel matrix (shown below) allows you to choose the channels that are to be used in the filtering process. You select/deselect channels by touching them. In itself the channel matrix does not specify the events to filter, but is used in conjunction with the Event Type switches described in the next section. Touch each of these event type buttons to toggle their inclusion (or not) in the filter. In addition, note, aftertouch, controller and program change event types can be also checked against the channel matrix by toggling the mini channel matrix button to the right of each of these types. If the matrix button for an event type is not selected then all channels for that event type are included in the filter. By way of example, the above two pictures show that Note On/Off messages are to be included in the (Allow) filter and that only those note on/off events that are sent on the channel specified in the channel matrix (1 and 2) will be considered. Aftertouch messages will not be considered at all. Event Filters can be used to split events from one input into multiple outputs. Simply connect the input to the outputs and then set an 'allow' filter on each output (or block filter) to allow only the desired channels for that output to be forwarded. With keyboard controllers (or other devices) that send active sense messages, you may find that blocking TimeSong events on that input (and thus filtering out active sense) will improve performance. 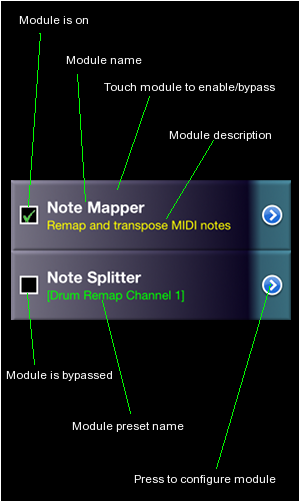 The Note Mapper module remaps any MIDI note event to a different note event. This module can be used to remap drum machines/instruments to different notes that might be expected by another device or app, for example an XG drum set to Nanostudio's TRG. Additionally, you can use this module to transpose all notes (NB. after they have been mapped) up or down a number of semitones. The minus button decrements the value in the grey box, and the plus button increments this value. You can also enter a value via the keyboard by touching the grey area. To remap one MIDI note to another, you first select the incoming MIDI note you wish to map using the left selector widget. You then use the right selector widget to select the note that the incoming note should be remapped to. Repeat this for as many mappings as you need. The number in the selector widgets for note numbers refers to the decimal MIDI notes ranging from 0 to 127. The note name (starting from C-2 for note 0 and ascending to G8 for 127) is shown above the selector widget. To add global transposition of notes passing through this module use the Note Transpose selector widget to set a transpose value in semitones. At the bottom of the screen is an out/in indicator matrix which provides an overall picture of the current mappings. 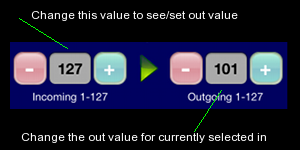 If a note is remapped then a red bar on the 'In' axis corresponding to the Out value on the Out axis is displayed. If no mapping takes place for a note, then the bar is green. This graphic is an indicator only. Touching it has no effect. 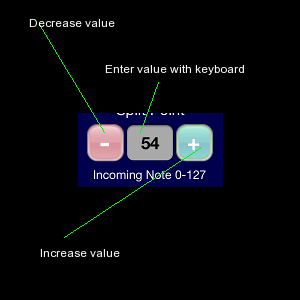 The Note Splitter module allows you to define a keyboard split point (note based) and then have notes that fall on the lower split be mapped to one MIDI channel while notes on the upper split can be mapped to a different channel. The lower split is marked in green on the keyboard and the upper split is marked in red. The lower split includes the note at the split point. If you set the split point to zero, then the lower split is disabled entirely and only the upper split is in effect. 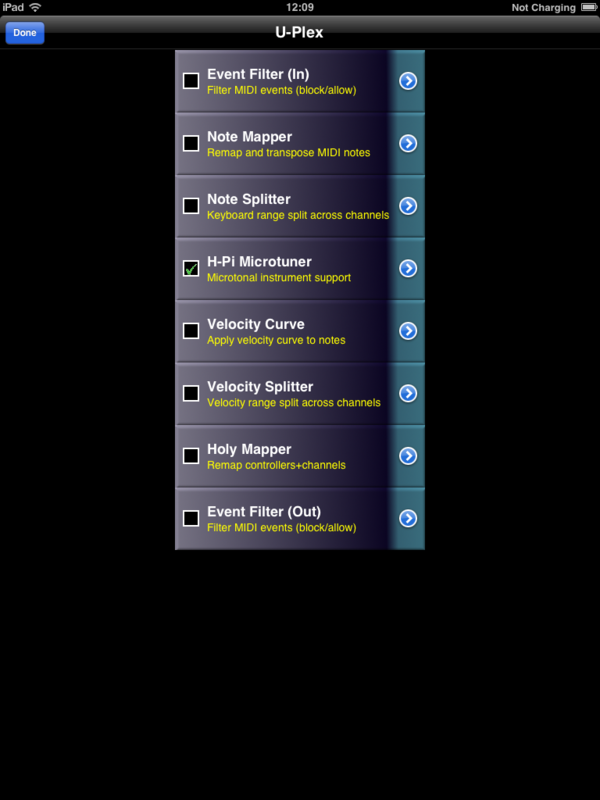 This setting is used when you want to remap all notes to a particular channel. H-Pi keyboards are microtonal instruments that send untuned MIDI notes. MidiBridge is capable of retuning the output of these keyboards so that they can be used with apps (eg. Arctic Keys, bs16-i and Thumbjam) and iOS MIDI. For full details about these keyboards and how microtonal retuning works, please see the H-Pi site at H-Pi Instruments. MidiBridge recognises the USB U-PLEX keyboard automatically and will activate the microtuner if this device is connected. For other H-Pi keyboards connected via a MIDI interface, the user needs to manually activate the microtuner via the H-Pi Microtuner module. MIDI Channel Engage/Disengage - retuned notes are sent to multiple channels in a round-robin fashion. To remove a MIDI channel from the pool of output channels, touch the relevant channel number so it is grey in colour and no notes will be sent on that channel. The most common use is to eliminate channel 10 (drum sounds). Note Stealing - the maximum polyphony of retuned notes is the number of engaged channels (above). 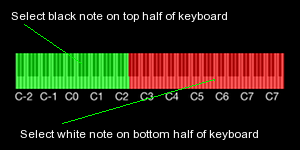 If the polyphony is exceeded, the note stealing option tells MidiBridge how to handle the situation. If this option is 'On', then the least recently played note will turn off and the new note will take its place. If set to 'Off' then when polyphony is exhausted no new notes will sound until already held notes are released. Note Velocity - This sets the velocity of all outgoing notes to a fixed level. If this is set to zero, then the velocity of the original note is used. The 'Init Pitchbend' button sends pitchbend initialisation messages on all engaged channels to all connected interfaces. This action sets the pitch bend range to one semitone. Note, this initialisation also occurs when a new device is connected/seen or if you navigate away from the H-Pi Microtuner panel. The Velocity Curve module allows you to apply scaling of the note velocities as they pass through the module. 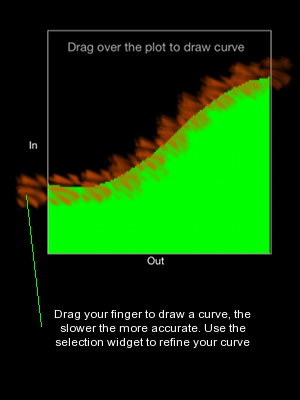 You can draw using your finger a curve or line on the plot to set a curve, and then use the selector widgets to refine your curve. In essence, the module maps the velocity of a note to a different velocity based on the incoming velocity. Some preset starting points for velocity curves have been included as factory presets courtesy of Breeze. The Velocity Splitter operates in a similar fashion to the Note Splitter, but the velocity of the note determines the destination channel. You can specify a split point using the top selector widget or touch the green/red area to set the velocity split point. Notes less than the split point velocity will be sent to the channel specified in the Lower Split selector while notes higher than the split point will send to the Upper Split channel. Not a religious reference but named after the customer who suggested this, the Holy Mapper maps controllers and channels interdependently. In other words you can map controller X on channel Y to controller X1 on channel Y1. Simply use the left selector widgets to select the incoming controller/channel combination you wish to map and then adjust the corresponding output controller and channel to suit. Memory Usage - Usually when MidiBridge runs, it uses about 12Mb of memory on the device. However, this can increase if the user accesses module configurations, as the app needs to load in the views to support these. If memory is at a premium, it is suggested that once the modules are configured, you press the home button to send MidiBridge to the background and then terminate it using the double-tap on home task manager. Restart MidiBridge and it will revert to the configuration it had prior to being terminated but only use 12Mb of memory. That brings us to the end of the guide (the astute among you will have noticed that we cheated a bit and just included the prose from the manual for the actual filter descriptions). If you have ideas for other modules that we could add to MidiBridge please get in touch as it is relatively easy (codewise) to add in new modules.